Most practical optimization problems are multi-objective in nature. Moreover, the objective values are, in general, differently scaled. In order to obtain uniformly distributed set of Pareto-optimal points, the objectives must be normalized so that any distance metric computation in the objective space is meaningful. Thus, normalization becomes a crucial component of an evolutionary multi-objective optimization (EMO) algorithm. 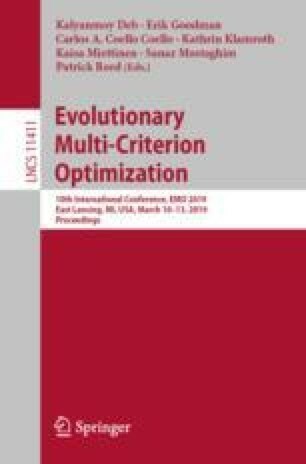 In this paper, we investigate and discuss the normalization procedure for NSGA-III, a state-of-the-art multi- and many-objective evolutionary algorithm. First, we show the importance of normalization in higher-dimensional objective spaces. Second, we provide pseudo-codes which presents a clear description of normalization methods proposed in this study. Third, we compare the proposed normalization methods on a variety of test problems up to ten objectives. The results indicate the importance of normalization for the overall algorithm performance and show the effectiveness of the originally proposed NSGA-III’s hyperplane concept in higher-dimensional objective spaces.